The Broadcast industry is always chasing new technology. Some of that technology is further than it appears to be, and some of it is closer to adoption than it seems. In part, early adopted technology is accelerated because of customer or business demands, and in the case of IP based environments, the driving factors are speed, cost reduction, and flexibility of workflow. To counterbalance these efficiency-based factors is a desire by content creators and customers to see more 4K HDR content on their new big screens. In some ways the push to deliver 4K workflows also makes the need to manage cost/performance even more urgent. At Primestream, our R&D has focused on satisfying these industry trends and delivering the components that customers need without limiting their options. When it comes to managing IP based signals, there have been several different technologies focused on different subsets of the IP universe. In SMPTE 2022 or 2110, and NDI we have technologies focused on bridging the world of coax with the world of cat6. These are broadcast standards focused on integrating broadcast environments and components. However; the world of streaming has taken off in the IT, prosumer and consumer spaces and now include everything from HLS, MPEG Dash, RTSP, and RTMP. Streams can come from live streaming sites, phones and cameras in the field, or web accessible cameras in your own facilities. Broadcasters need to manage IP along with the SDI and other signals used today. We have found that in the end, the workflow hasn’t changed, just the signals, so we have made an effort to maintain how people work by allowing them to work the same way with new sources as they do with familiar technology, giving them all the benefits without disrupting their process. With many of these new IP signals, 4K gives facilities the ability to bring in high quality content efficiently. There was a need to make sure that 4K content could also be managed without disrupting the workflow. This means making sure that Wide Color Gamut or HDR would be maintained, proxies could be generated and used to reduce bandwidth requirements, and craft editor integration could support more complex projects including higher resolution materials. 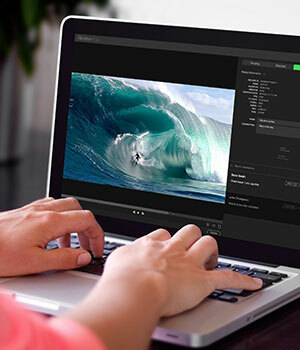 To create complete 4K workflows, it’s necessary to support live ingest, file ingest, and IP streaming with the ability to create proxies, support the complete creative editorial workflow and ultimately deliver content as streams, files, or over IP. In this push to 4K, we see a bump in the cost of storage, strain put on processors, and on the network itself. All of this makes file based, IP based, and proxy-based workflows more cost efficient and desirable, so the requirement for 4K also pushed the need for all of the other technologies. The days when manufactures had to build proprietary solutions to guarantee that they could deliver solutions are gone. Everyone wants to build based on off-the-shelf IT components where possible and connect best in class systems with affordable components. In order to do that, it is critical that the systems at the core of the workflow allow for rich extension to their functionality. Part of this comes through the ability to script workflow, and the rest comes via API’s. Scripting allows you to set up rules that can automate when material goes to connected components, what to do with the data that comes back, and the API’s are how you move the data back and forth. Without the scripting you end up with 3rd party integrations that are manually triggered and you can’t create seamless integration with best in class components. The combination is the difference between having an API engine automatically supplementing metadata on all of your ingested material and the act of saying “I am going to send this material off to that 3rd party component to be analyzed so I can then work with it when it comes back.” Both get the job done, one is invisible, the other is not. To do this, the API needs to be rich enough to let the external system access everything it needs. It to be well documented with examples and well supported, because integration is a fact of life. Many of these technologies simplify access to the system, to content, and to the process, and all of this raises the question of security. The API’s need to be secure, your network needs to be secure, and access to content via permissions needs to be secure. While there are methods to secure the production network itself, the need to move material or extend the workflow for approval means that there will be a need to cross that secure barrier at times. There are two additional steps that go beyond just securing the production network that can help. The first is that the production system itself offer levels of security that limit what users can do with content based on their permissions, the second is to give a secure method of external delivery or review of sensitive content. We had to take a hard look at these requirements when launching ReviewHub, our review and approval solution. We decided to eliminate the creation of separate files for review and instead created server to server communication to move secure files outside of the firewall to be accessed via private URL or password protection. This allows the perimeter security around the production system to remain tightly secured. While the desire is to continue working in the same ways that we have in the past, the need for more efficiency, to lower cost, and to leverage IT based technology continues to deliver both new opportunities and new challenges. The best “next generation” systems will manage to balance both.